I love versatile recipes. This simple chickpea mash can be made into an elegant hors d’oeuvre or eaten plain with a spoon in your pajamas. I must confess, the latter is usually how I eat this dish, but I didn’t think you wanted to see a picture of me in my pajamas on my couch eating mashed chickpeas. So you get to see the fancy version. While it looks fancy, it’s dead easy. Mash the chickpeas with yummy stuff (recipe below), place a small amount on a cracker, add a slice of a fun veggie, something leafy, and voila! Party food! I got these breathtaking radishes (I never thought I’d describe a radish as breathtaking. Ever.) from my CSA. They called them “storage radishes.” I don’t know about you, but something called “storage radishes” doesn’t exactly excite me. Imagine my surprise when I sliced one open and was greeted by a shocking pink center. Storage radishes? That’s really the best they could do? What about “Super Awesome Party Radishes” or “Ridiculously Fun Magic Radishes”? When I sliced them I thought that they looked like watermelon, and sure enough, a google search for “watermelon radish” yielded photos that look very much like these. Watermelon radish is a much better name. In terms of taste, they’re mild and crispy, and a teeny bit sweet. Personally think that makes the perfect as a garnish, since they won’t overwhelm any other flavors in your dish. There are a few different ways I eat this chickpea salad. 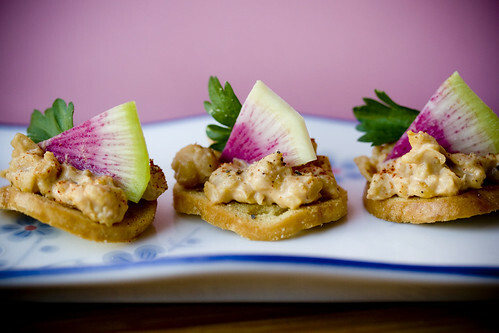 As Hors d’Oeuvres, shown. As a simple dip with crackers or veggies. On open faced-sandwiches. 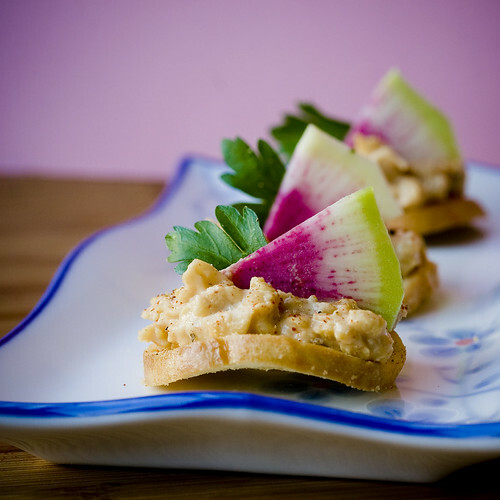 Or–my husband’s favorite–chickpea melts: spread the chickpea salad on slices of bread. Top with your favorite vegan cheese, and bake at 350Âº F for 10 minutes. Broil to finish, serve immediately. I use a prepared vegan mayonnaise in this recipe. There are a few different brands out there, but for this I recommend Vegenaise. Nayonaise is a little thinner and has more tang, and while I like it on sandwiches, it’s not the best match for the chickpea salad. I hear Trader Joe’s has an accidently vegan mayo (I think they just bill it as Low Fat, but it happens to be vegan), but I haven’t tried it yet so I can’t recommended it. Feel free to be creative with your toppings. Carrots, chives, sesame seeds, paprika.. whatever. Think about color, texture, and flavor. There are a million different (and easy) ways to make party food look fun without over-complicating things. 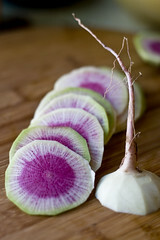 But if you can find watermelon radishes, I highly recommend them. They look like regular white, round radishes, but the long root has a pink tinge. Here’s a photo of a whole watermelon radish. Mash all the ingredients to form a chunky spread. Refrigerate or serve immediately. 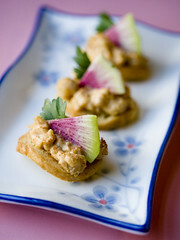 this looks so tasty & simple for an appetizer or just an everyday type of snack. the local coop i work at and the CSA call those watermelon radishes… now that sounds tasty. I’m so impressed with your recipes and photo talents. I just made this and it’s insanely yummy. I’ll be bringing to my party tonight. at the ferry building farmers market in SF these radishes were all over the place, the farmers called them watermelon radishes. they are SO beautiful and rather tasty!! !